The founder character is a child with no adults around (unless the game assigns her a babysitter, who she will ignore). The founder starts with absolutely no simoleons and no items. She’s a runaway child after all. She is not allowed to collect flowers for money or use pets to collect items because both are ridiculously good ways to make money. However, she can collect insects, small pets, and rocks found around the map. She will start on an empty 10×10 lot somewhat hidden from the rest of the town. The founder will not attend school as a child (she has no one to register her). This will be accomplished using the Homeschooling option in the NRaas Careers School mod. There’s no curfew (using the Curfew Disabler mod). This is a sleepy rural town with a small police force, there’s no need for a curfew. Once she reaches adolescence, she will be able to move to an apartment lot if she has enough money. Once she reaches adulthood, she will be able to purchase the empty 64×64 lot not far outside town. Her starting traits will be Good, Clumsy, and Loser, just like Alice. Anything after that is my choice. Every heir afterwards will have the Good trait and at least one of the following: Clumsy, Loser, Coward, Insane, Loner, Neurotic, Over-emotional, Socially Awkward, Unlucky, and Unstable. While they may have inherited the founder’s kind nature, they also inherited some of her bad luck. Any other traits are my choice. Every heir must have a different career. Just because I like exploring the different careers. I tweaked the age length to a bit longer than usual because I always feel like I’m rushing around otherwise. The founder and heirs will probably all be female, just because I like playing female characters. Adopted sims are allowed. The Legacy Challenge goes for 10 generations and that’s what I’ll be shooting for. I’ll likely make up more rules as I go to increase the challenge and the fun. There’s no sense in letting things get boring! Now it’s time to introduce the founder, Addie Salix. When Addie ran away from home, she didn’t know where she was suppose to go, only that she had to get away. She had planned to take a small bag of food and her only teddy bear but when her father found her little stash, she knew she had to leave without it. Before she left her hometown, she used all of the spare change she happened to have in her pockets to buy a hamburger at the local fast food restaurant. She knew a train would take her away from this place so she managed to squeeze her way into a boxcar filled with plastic-wrapped sofas. After the train was underway, she left her hiding spot and spent the night sleeping on one of the sofas while the train took her away to a new place. Early the next morning, she found herself in the Crumpleton area…and her boxcar was to be unloaded there. She scrambled into her hiding spot just in time and when the workers took their tea break, she very carefully crept out of the boxcar and made for the forest. The first time she tripped and fell on her face, she scrambled to her feet with her heart pounding in her ears and just dashed madly through the trees. It turns out that she was lucky for once, by the time she had fallen, she was too deep in the forest for anyone to hear. Addie was still covered in twigs and dirt by the time she arrived at the outskirts of the town itself. She slipped into a public washroom to wash off the dirt and comb the twigs out of her hair so she at least looked somewhat normal. As she left the washroom, her stomach made a resounding growl. She was hungry and she had no money. At least, not yet. It took a little time to locate the science center but a grin stretched across her face once she did. She knew that they were always looking for insect donations and she had always been good at finding and catching them. After all, it’s how she had purchased many a suppers previously. She spent the whole day scouring the town looking for butterflies and beetles and by the evening, she found enough to earn herself §164. It was certainly enough to buy a hotdog from a vendor in the festival grounds, which she wolfed down immediately. While dead tired from running around for hours, she spotted a general store (and comic shop) not far from the grounds. 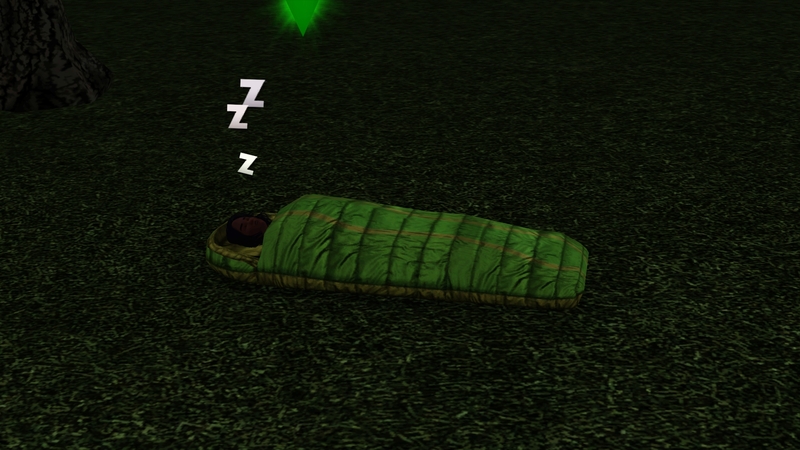 In there was something was of the most beautiful things she had even seen: a shiny green and yellow sleeping bag. It looked about as soft as those sofas had been. 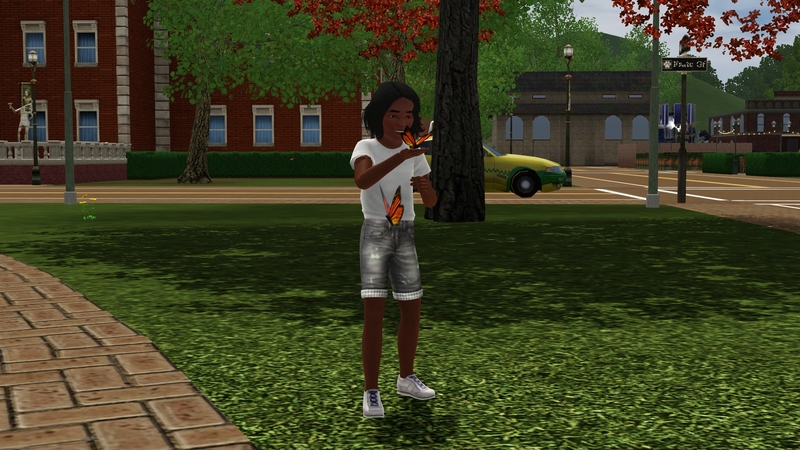 And she had enough simoleons left over to buy it. With her new prize slung over on shoulder, she resisted the urge to spend the night sleeping in the park. Moving out of town (and in the opposite direction of the train yard), she crossed a bridge to find herself in the wealthy area of town, with several mansions on large yards separated by large tracts of forest to promote privacy. She wandered off into one of these sections, staying close enough to the bridge so that going back into town would be easier, yet deep enough so that the trees would hide her. Once she found a suitable spot, she laid out her new sleeping bag, crawled into it, and almost immediately fell asleep.